In January of 2017, Global A.K was designated as an Agent for Black Eagles' full trip(attendance and return) for 2017 Malaysia Airshow. 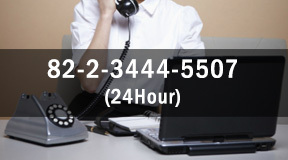 GAK staff had dispatched in each transit airports for Black Eagle's safe trip and military action. In March, we had supported on Ground Handling, Flight Planning, Fuel, Outside Arrangements(Hotel, Transportation, Restaurants, and etc), and etc for ROKAF's trip. By the end of the month, GAK had successfully terminated the 2017 Malaysia Airshow Business. Refer to below article about Black Eagles' attendance at and return from 2017 Malaysia Airshow. 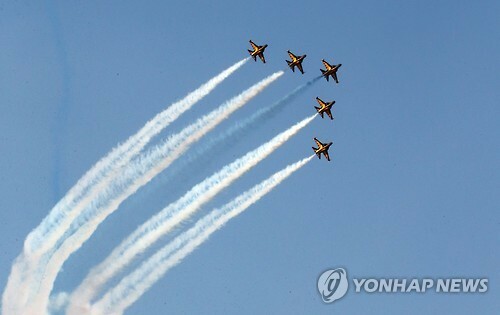 SEOUL, March 21 (Yonhap) -- The South Korean Air Force's aerobatic flight team will perform at a Malaysian air show on Tuesday, yet another chance to promote the nation's advanced trainer jet in the global defense industry, the Air Force and the defense ministry said. The Black Eagles team is scheduled to appear in the opening ceremony of the Langkawi International Maritime & Aerospace Exhibition (LIMA), one of the largest annual air shows in the Asia Pacific region. Known for the world's top-class flight skills and highly organized teamwork, the full-time aerobatic squad will be a highlight of the event, according to the Air Force. Eight T-50B supersonic trainer jets plan to stage various performances including its trademark show of drawing a huge heart and the taegeuk mark with trailing white smoke via flight in perfect synchrony. 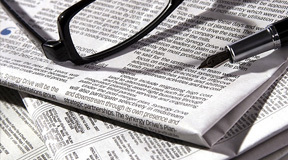 "It's expected to serve as a good chance to promote the excellence of T-50s," Moon Sang-gyun, the ministry's spokesman, said at a press briefing. The producer Korea Aerospace Industries (KAI) is seeking to join the U.S. T-X program to replace its Northrop T-38 Talon fleet with new jet trainers. 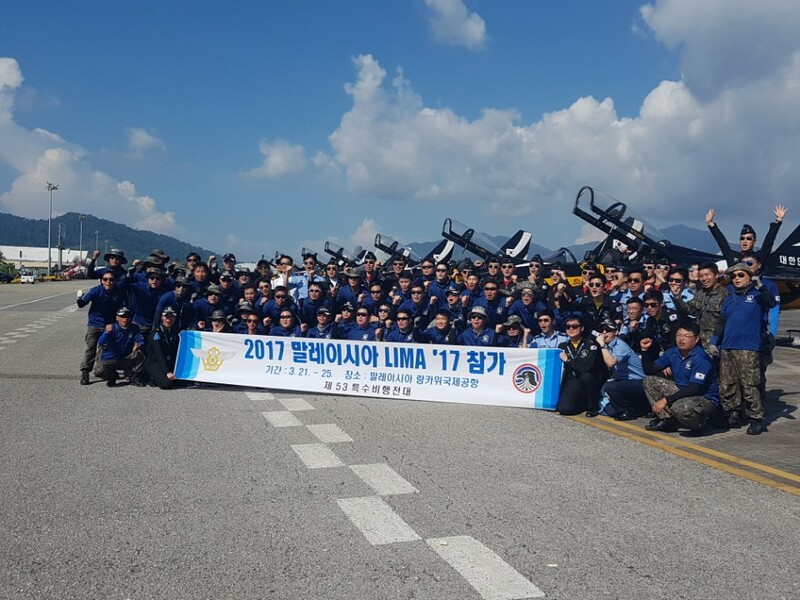 In a highly symbolic move, meanwhile, the Black Eagles will also perform a joint show with Indonesia's Jupiter aerobatic team, which uses KT-1B Woongbi aircraft developed by South Korea, at the LIMA's opening ceremony. 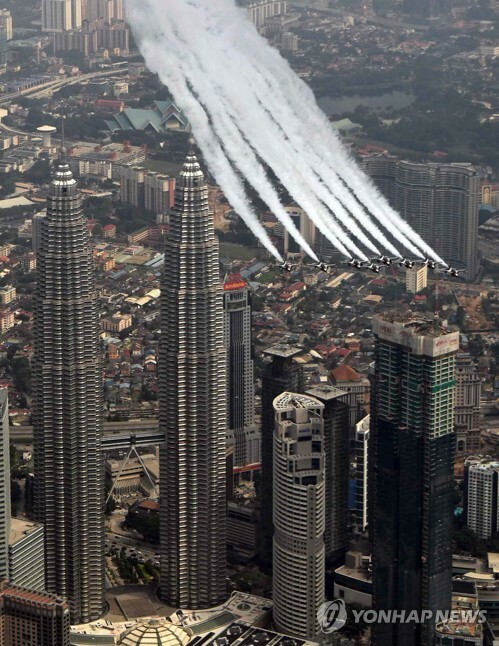 SEOUL, April 1 (Yonhap) -- The South Korean Air Force's aerobatic flight team returned home Saturday after participating in a Malaysian air show, the Air Force said. 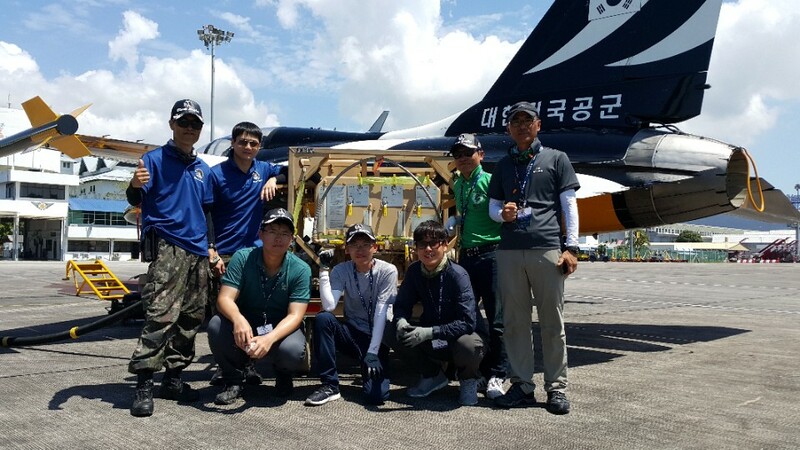 "The Black Eagles arrived back safely at Wonju base at 11 a.m. today," it said. Wonju is a city located in the eastern province of Gangwon. Eight T-50 supersonic trainer jets of the Black Eagles team completed a total of eight demonstration flights at the Langkawi International Maritime & Aerospace Exhibition (LIMA), one of the largest annual air shows in the Asia-Pacific region, held from March 21-25. The event drew representatives from around 500 defense industry firms in 36 nations and more than 200,000 visitors, according to the Air Force. It offered a good chance for South Korea to publicize the T-50s as it seeks a contract with the U.S. for its T-X program to replace the Northrop T-38 Talon fleet with new jet trainers.